Most mornings when I go to work I stop at McDonald's to buy a single sausage burrito. A $1.00, 300 calorie breakfast. I am usually in the drive thru between 6:30 am and 7:00 am. It takes me 3 seconds to order, and since I have my $1.08 in hand (tax is $0.08), it take me about 5 seconds to pay. I know what I want, I know how much it costs and I have the money ready at the first window. At the second window, they hand me my bag as my car is still moving. My ordering, paying and pick up is almost like an art form. The whole thing is like a ballet where the young prince spins the dancing swan, lifts her up and she flies away creating joy in all who watch this dance. However, I frequently get behind people at the order board who have no clue what McDonald's offers, who have no clue at what they want, who are ordering for nine people and who pay with a credit card. Today, there was only one car at the order board ahead of me, a young woman in a white Honda SUV. She was alone and she was the only person between me and the second window, the pick up window. It looked like clear sailing for me. I could picture my breakfast order, payment and pickup ballet playing out like the New York Ballet Company's Swan Lake. Wrong. The lady in the white Honda, took approximately six minutes to order. Six minutes doesn't sound like a long time, but when you are behind someone who is ordering at a drive thru, it is an eternity. Try holding your breath for six minutes. Listen to Roseanne Barr sing for six minutes. Watch someone line up a putt for six minutes. If a space shuttle booster rocket ignites for six minutes too long, the astronauts miss the moon by something like a trillion miles. As she ordered, I looked at my watch like 11 times. I heard an entire interview on the Dan Patrick sports talk radio show. After she left the order board, I ordered in my usual 3 seconds. "One sausage burrito with mild sauce". I almost beat her to the first window, but unfortunately, there is no passing lane in the drive thru. So we reach the first window at essentially the same time, with me one car length behind. Once she gets there, she reaches over to the empty passenger seat and finds her purse. She picks up her purse, puts it in her lap and opens it. I can see all of this through the back window of the white Honda. She pulls out her wallet, finds her credit card and finally hands the credit card to the clerk. From the time we both arrived at the first window to the time she handed over the credit card was about 2 minutes. Then it takes the clerk about two minutes to run the card through the register, hand the credit card slip back to the lady in the white Honda for signature, get the slip signed, hand the credit card back and finally the lady in the white Honda hands the signed credit card slip back to the clerk. Now she opens her purse again, pulls out her wallet, inserts her credit card in the wallet, puts the wallet back in the purse and drives to the second window. This entire payment process was painful to watch. It was not a ballet at all. It was like watching a goat give birth. Now its my turn at the first window and it takes me less that 3 seconds to hand the clerk my $1.08 in exact change. I arrive at the second window 2 seconds behind the lady in the white Honda. My Buick Enclave was so close to the white Honda that I was actually drafting just like in NASCAR. I sit at the second window for approximately 7 minutes while the entire McDonald's staff is working on her order and they finally hand her 4 coffees and three large bags of food and I mean large bags, bags with handles. It takes her about 45 seconds to secure the food and coffee on the passenger seat and then she crawls away, at the speed of a three toe sloth. As my car is still in motion the clerk at the second window hands me my little bag containing only a single sausage burrito, a small bag of mild sauce and a napkin. As is I start to pull away from the second window, someone is entering the drive thru the wrong way. My front bumper is almost touching his front bumper by the time he realizes he is going the wrong way. I had to wait while he backed up into morning traffic on Seventh East. Tomorrow I think I will make me a scrambled egg at home before I leave for work. Yesterday I got my hair cut at a salon, although I swore I was never going to a salon again in my Blog Entry dated June 25, 2009. Anyway, a lovely lady washed my hair, cut my hair, and rinsed my hair. I thought it looked pretty good. After the haircut I picked the Lovely Sharon up from the airport and went to dinner at Hidden Valley Country Club. As we walked in the Club restaruant we saw Chuck, his wife and several friends. The first thing Chuck said was that I ought to sue my barber because he had committed mal practice. The rest of Chuck’s table enjoyed Chuck’s quip and added their own comments. For me it was funny and I laughed at all of the comments. However, can you imagine telling your wife her hair dresser/stylist had committed mal practice. She would go hysterical on you, she would cry and her feelings would be seriously hurt. You would be out of the house. You would live a monk’s existence for months. If you don’t believe it guys, next time your wife gets her hair done, try telling her that she ought to sue her stylist. Rigggght, not one of you has the courage to do that even in jest. It would be like putting you hand inside a lion’s cage. If you do, you know you are going to lose something. On sports talk radio, a bunch of the fellows call each other “Dog”. “How’s it going Dog? “Nice game Dog”. “Hey Dog lets go grab a brewski”. I think it sounds cool, it sounds manly, it shows your closeness to your pal. Just today I sent my buddy Gordon an email that read "Hey Dog are you playing golf today?” However, under no circumstances should you use Dog as a term of endearment when talking to a woman. Do not tell your mom, “Great dinner Dog”. Don’t even think about telling your wife when she gets out of the shower, “Hey Dog, what are you doing today?” What do you think will be put in your food if you tell the waitress “Hey Dog I will have the prime rib”? My friends harass me and each other about being overweight. When you bend over to pick up your golf ball from the cup, you might hear “Hey you gotta couple of hams in there?” Try that with a woman and then laugh. See how that works out. In conclusion, you must think through who your intended audience is before your pull the trigger on your statements. It is unbelievable; summer is over, where did it go? Today is the first day of autumn, my favorite season of the year. Kids have gone back to school, discussions of football are everywhere. Although on the calendar autumn marks the commencement of the end of the year, for me it has always felt like a beginning. That’s probably because of so many years of schooling, where autumn marks the beginning; a new beginning with new friends, new classes and new things to learn. I was always excited to go back to school. I suppose I have never gotten over this feeling of new beginnings despite it being more than 32 years since I finished school. I love the cool crisp air that autumn brings. Although the days are typical enjoyably warm in the early autumn, the early morning and evening temperatures are invigorating. I had a nice dinner at a friend’s house last night. It was a lovely evening, fine discussion and good companionship. When I walked to my car after dinner around 8:30, it felt cool, crisp and wonderful. I love an autumn Saturday morning, when you wake early and walk outside to pick up the newspaper. The night time sky has lightened a bit but is not quite dawn. The stars are still bright in the clear sky. The driveway is more than a little cool on your bare feet. You look around and the neighborhood is still quiet, most folks still asleep in their warm beds. This time of day for me is almost a spiritual time with its serenity, low light, and quiet calmness. Autumn in Salt Lake City is hard to beat, with the Wasatch Mountains turning red, orange and yellow. The mountain side below Lone Peak is the view from my front yard. After all these years it can still take my breath away to look at it. The stags on the Hidden Valley Golf Course grounds now have their antlers and they look magnificent as they walk from fairway to fairway. A wonderful thing to do in the autumn when the leaves start to fall is to take a walk down First, Second or Third Avenue in Salt Lake City’s Avenue’s section. There are many wonderful old homes, tiny yards, eclectic neighbors and large beautiful trees. Yards are covered with a carpet of leaves of yellows and reds. As cars drive past, whirlwinds of leaves jump in the air. Get outside, enjoy the autumn, smell the air, throw some leaves in the air. Yesterday I dropped the Lovely Sharon off at the airport. She is in Temecula, CA playing in the Southern California Golf Association club champion’s tournament. As many of you know, Sharon is the 2009 Ladies Club Champion at Ironwood Country Club in Palm Desert, CA and therefore she was invited to play in the Temecula tournament. She won’t be back in Salt Lake until Wednesday. Although I miss her, I am so proud of her to qualify to play in this champion’s tournament. Although I have focused on the humorous aspect of our marriage in this blog, the Lovely Sharon is my true love and is always trying to help me do better and be better, a difficult task for her. I look forward to her call this evening. OK enough of the mushy stuff. OK, the rest of this blog entry is probably depressing so you may want to go to a humorous web site. Check out, “We are from the government and we are here to help you.com”. I am feeling a little dark tonight so you may want to avoid the rest of this essay. Friday afternoon we played golf with our dear friends Norm and Terry. We have not seen them in a couple of weeks and it was a true pleasure to golf with them and to have dinner together at the club. Terry’s father passed away this year and her mother has recently broken her hip. Life problems are there to deal with for each of us. I am sad for them. Just when we think we have things going good, something comes up for us, our family or our friends that sets us back. I just found at today that one of my dear golfing buddy’s baby was stillborn Friday, what a devastating turn of events for this wonderful family. My love goes out to them. My friend is a Mormon Bishop and spends much of his time helping others with their problems. He is a kind, wonderful man. I love you pal and my heart goes out to you and your wife. I went to Church today. After the service I talked with my dear friend Monsignor Terry Moore, the wonderful Irish born Pasteur of the St John’s the Baptist Parish. He is my religious leader, my friend and my neighbor. He is one of the nicest and kindest human beings I have ever met. Monsignor Moore told me that someone stole his golf clubs out of his garage. His garage was open and he was in the house talking Church business on the phone. When he went back to his garage he saw that that his golf clubs were gone. I can understand a hungry man stealing a loaf of bread at the convenience store or a new poor, single mother stealing milk for her baby. But to steal golf clubs from anyone is an immoral act and to steal golf clubs from a priest is a cardinal sin. I think in the gospel of St. John, or maybe its in Revelation, it says something like thou shall not covet or steal the Callaway’s of a religious leader. I am pretty certain that the thief or the receiver of stolen property who buys the clubs will probably hit horrible shots with the stolen clubs. I think this sin is worthy of Old Testament type punishment, a plague of locusts, a plague of boils, a seven year drought or at least a case of the perpetual shanks. Throw the thief in jail for life, no parole. The University of Utah and BYU both played poorly and got beat yesterday. I am a Utah alumni and fan but also pull for BYU until they play Utah. Then I want Utah to demolish them. Both teams were highly ranked and both looked horrible. If you read my Thursday blog, you aware of my recent diagnosis of diabetes. Since Thursday I have taken the pills, watched my diet but the blood sugar numbers are not coming down yet. I keep poking my fingers and using the meter but no changes yet. I am a little down. The government is still in disarray over health care. I don’t care if you are democrat or republican, conservative or liberal, American citizens ought to have reasonably priced access to health care regardless of income, regardless of preexisting conditions and regardless of employer. We are funding libraries and schools in Africa, the Iraq war, the Afghanistan war, weapons for Europe and Israel, but we can’t provide healthcare to all Americans. It’s a tragedy. I do not understand middle class people who oppose a government option for those with no other choices. The proposal is not to have a government only healthcare system; it is to provide a failsafe for those who aren’t covered. These healthcare rallies, are scary, people showing up with guns, signs that say we will bring weapons next time. I assume if you are carrying a gun at a rally or threaten to bring one, you intend to use it. Do you want you kids or spouse to attend a rally where people are screaming and carrying weapons? This behavior scares me to death. These people have such venom and such hatred that it is un-American. Are the senior citizens at these rally’s who oppose a government option willing to give up their Medicare? Are the Veteran’s willing to give up their VA healthcare? I think not. Is it socialist for the rest of us to pay taxes used for their healthcare? The banks, brokerage firms, auto companies, and other companies that receive government bail outs all provide healthcare for employees when these companies are receiving bailout money. So who doesn’t have healthcare, its many small business employees, the poor, and those with preexisting conditions, among others. I have a friend who is opposed to healthcare reform but he has a daughter with severe health issues. He is trying to get her set up to be covered with health insurance in a manner in which she might not be truly qualified. He is trying to manipulate the sytem. The reason why, is that her condition requires expensive treatments and care that are not covered by his insurance. Here is a man that pays his taxes, helps his neighbors, employs people in his small business, but his daughter is not covered by insurance. This is wrong. He has helped people his whole life and when he needs help, his daughter is not covered. How can he be opposed to reform? I know many of you don’t agree with me, but if you are not covered or you kids or parents are not covered then I will be surprised if you are opposed to a government alternative. Do you really think Blue Cross is there to help you. I have expensive insurance from my firm that I pay a big part of. However, I was not covered for a recent colonoscopy. My wife was not fully covered for a recent mammogram. OK, this was a not a fun or inspiring blog entry, I know it and you know it. Just write it off to me having an off weekend. I promise next entry will be humorous or inspiring. PS, keep your garage door closed. After dizziness, sweats and other ailments yesterday, and an unscheduled trip to the doctors, the doctors have concluded I definitely have diabetes. That is combined with high blood pressure and high cholesterol. The Lovely Sharon is helping me get on a program of better eating habits, blood sugar monitoring and medication. At the end of the day yesterday, I was pretty depressed. Reading books about organ failure, amputations and other ghastly things. I awoke at 4:00 am today, tested my blood sugar, made coffee and read various news stories on the internet. With the dawn of a new day (figuratively said since its still dark outside) I am ready to get back on the horse and gallop across the prairie. I am not certain what that means but it sounded good until I reread it and now I realize its sounds stupid. So lets try again, "I am going to get back in the golf cart and head to the first tee". I try to write blog entries that provide humor or pathos to the reader. To stir the emotion of the reader with laughter, with descriptions of beautiful and emotional things and with words that swell the heart, has been my direction. I like to point out the humor and absurdity in everyday life. There is plenty of that. So after feeling sorry for myself last night, I am looking at the Big Picture again this morning. For example, (I already told a couple of friends who read this blog about this event so I hope they bear with me). As described in the previous blog entry, last week a swarm of us went to McCall, Idaho for a golf tournament and nearly week long party. After the final round of golf, the Lovely Sharon and I, went to a jewelry store to check out things. We looked around and decided to buy a couple of reasonably priced pieces of costume type jewelry. Sharon found a very pretty star burst type necklace. As the jeweler was ringing it up, he said it was a unique and nice piece that should hold up well but it could be damaged if Sharon sat on it. To me it was an absurd statement. It made me want to ask him to show us some necklaces that Sharon could sit on. I have thought about this for a week and it continues to make me wonder why the jeweler thought this advice was necessary. It is kind of like asking a waiter at a fancy restaurant if the prime rib dinner is good and having him respond, "It is very good, unless you sit on it." Oh in that case I will have pasta, its always nice to sit on. A number of years ago, Son Alex and I were on a plane heading somewhere on an adventure. He was reading the back of his ticket (this was before the time of e-tickets and before 9/11 related travel restrictions) and he pointed out to me that it violated FAA rules to set off flares or fireworks on the plane. It made me wonder what events had actually happened that made the government adopt this prohibition and require the airlines to print it on the back of the ticket. When Alex read these rules to me I immediately could picture a passenger lining the aisle of the Boeing 737 with a series of flares leading from his seat to the bathroom. Because of this rule, the flight attendant would have to say "I am sorry sir, but you can't light those flares on this flight. This is a non smoking flight and a non-flare lighting flight. And by the way, you are going to have to put those roman candles away." On another adventure, Son Alex and I went to San Francisco when he was about 10 years old. It was just the two of us. We were walking near Union Square and this woman was walking toward us on the sidewalk. Her "Bosum" was colossal. It looked like the front end of 1961 Cadilac. It looked like a couple of nuclear warheads arising out of a bomb silo on the Kansas prairie during the cold war days Despite being with my young impressionable son, I could not quit looking at this woman (ok, or a part of this woman) as she approached us. I was not at that time paying any attention to where Alex was looking but when the woman got to within about five feet from us, 10 year old Son Alex said in an accent like "Scotty" on Star Trek, "Watch out dad their gonna blow". I almost could not walk any further because I was laughing so hard. Out of the mouths of babes. Today the Lovely Sharon and I have 1:45 pm golf with dear friends Norm and Terry. Enjoy your life, love your family and friends. Hug them and tell them you love them. Look for things that make you laugh and swell your heart with emotion. What a wonderful week the Lovely Sharon and I just had. It was a week filled with beautiful scenery, great golf and wonderful friends. What could be better? On Tuesday September 8th we drove from Salt Lake City to McCall, Idaho. If you have not been there, you may wonder where the heck is McCall, Idaho? Well its 100 miles north of Boise and the drive from Boise to McCall is beautiful with the road meandering aside the Payette River and in places not far from the Cascade reservoir. The purpose of the trip was to play in the Fifth Annual Payette Cup, a couples’ golf tournament sponsored by the Shore Lodge Hotel and the Whitetail Golf Club. Sharon and I have played in this tournament for each of its five years. The first year we did not know any other players but became fast friends with a number of the other couples and the hotel and golf club staff. Since that first year we have brought a number of friends with us and last week we had about 14 couples from Hidden Valley Country Club and another 3 or 4 couples who were friends of the Hidden Valley couples join us. We joined a number of Whitetail club members and other players in the tournament. We stayed at the beautiful Shore Lodge, an Idaho institution since the 1940’s. The Shore Lodge sits on the edge of Payette Lake, one of the most beautiful lakes you have ever seen. It’s a 350 foot deep, natural lake which is sparkling blue surrounded by green forests and beautiful mountains. Looking out the windows from our room was truly a wondrous view. Just before dawn, the lake looks silver, the same color as the sky. The mountains are dark silhouettes, as are the boats tied to the hotel dock. The lake is still. There is almost no discernable color except for the yellow lights on the dock and no sound, not even the birds are up yet. As an early riser, each morning I would stand on my balcony in the cool crisp air and watch the sky get lighter as daytime approached. The only sound was the soft breathing of the Lovely Sharon, still asleep. What a feeling of awe and serenity. By midmorning the lake is cobalt blue, filled with motor boats, sail boats, water skiers and kayaks. It is a hub of activity and sounds of recreation. The Whitetail golf course is one of my favorites. The front nine meanders through the forest and the back nine has a few holes that are carved into the trees but six of the holes have been laid out in the meadows of the McCall valley. For me the front nine plays easier than the back nine but there are still some challenging holes, including the fourth hole that has two greens. When the right green is used, it creates a need for golf skill and strategy that are beyond my skill level and my strategic reasoning ability. It becomes apparent on this hole that my personal standards for my golf game far exceed my ability. We played golf every day and had wonderful socials and dinners each night with our dear friends. Each night it was delightful to listen to the 34 or so players recap their day’s adventures on the golf course. Tales of heroic shots, lost balls, watery graves and screw ups by spouses are heard each evening. One night I heard Mike say a couple of times that they would have done ok if Jane could just make a damn putt. One day on the par five 12th hole, the male part of the couples team we were paired with hit a ball in the trees, dumped the next one in a bunker, duffed it out of the bunker short of the green and then bladed a 30 yard 60 degree wedge over the green. When his wife missed an eight foot put for bogie, he said to her “we really needed that”. The look she gave him was, what can I say, interesting. Jokes, insults and laughter abounded every evening. To share time with our dear friends is irreplaceable. To hug each other and to listen to each other’s stories is more precious than gold. On Friday night Whitetail Club Members and McCall residents Kevin and Cathy invited all of us to their house for cocktail and hors d'oeuvres. Their house sits on the top of a mountain overlooking the Payette Lake and the golf course. What a spectacular view. On Saturday, the Lovely Sharon and I played with dear friends Barry and Nanette. On the par five, second hole, I put my third shot to within 18 inches of the pin. Not to be outdone, Barry hit his shot to about 8 inches. Barry had to mark his ball so I could putt. For several holes Barry and I wondered aloud about how lucky our wives must feel to be married to such golfers. Our wonderment stopped when I hit one in the lake and he hit one in the trees. Each year there are new players joining the fun for the first time and some old friends are not in attendance due to the events of life that come around for each of us. This year the golf course was perfect, the weather was perfect and our companions were perfect. Just over a week ago, a new baby came into our life. The Lovely Sharon’s son, my stepson Nick and his beautiful wife Ali had a baby girl, Kendall Marie. The baby, mom and dad are doing great. Being the lawyer that I am, before the baby was born and even the day she was born, I had uncertainty what my relationship would be with Kendall. 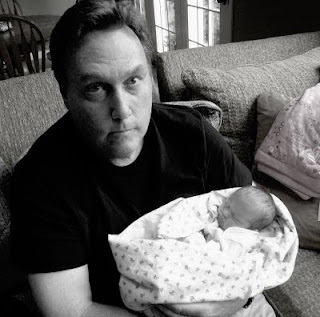 I knew I would love the baby but did not know if I would feel like a grandfather or be perceived as a grandfather by Nick, Ali, Kendall Marie and others. I wondered if I myself would feel like a grandfather. I am a stepfather but I really have not heard the phrase “step grandfather”. When I married Sharon, her two boys were already out of the house. I have been friends with both of Sharon’s sons before I was ever involved with Sharon. They were nice boys who grew up to be nice men. The boys’ father has been a tremendous, giving father to them and will no doubt be a doting grandfather to Kendall Marie. As the time of birth got closer, Sharon’s excitement about being a grandmother grew. I continued to wonder about my own perception of what I was to the baby and how the family would perceive my role. As a lawyer, it is my job to over analyze all aspects of the matter I am working on. To consider the matter from all directions, to contemplate what the other side is thinking and what they really want, to plan a strategy to accomplish what my client wants. I do this every day at work and have done so for more than 32 years. The problem with this is that you bring this behavior home with you every night. The very actions that make you a better lawyer are sometime impediments to personal relationships. So as the birth of baby Kendall Marie neared, my angst grew. I discussed the situation with the Lovely Sharon. I told her I did not want to make assumptions as to my role with the baby that might offend the family. She told me that I would be a grandfather and that baby Kendall Marie would have three grandmothers and three grandfathers. Despite this assurance, I still was uncertain, had anxiety and in general, was still clueless about the whole thing. On the day the baby was born, we visited mother, father and baby in the hospital. I was excited and got teary eyed. I was too nervous to hold the baby but stared in utter awe at this brand new human being, wondering what she was thinking, if she was thinking at all, what she was feeling. She had traveled from the total warmth, protection and comfort of the womb to the sterile environs of the hospital room with bright lights, strange sounds and giant creatures (us) surrounding her. It had to be a shock to her system but I suppose she must have been comforted by the sound of her mother’s voice and the gentle warmth of her mother’s arms holding her close. I don’t recall now if Kendall Marie smiled, but I know I did, inside and out. Welcome to the world granddaughter. A Taser is an electroshock weapon that uses electrical current to disrupt voluntary control of muscles. Taser is an acronym, named for a fictional weapon: Thomas A. Swift's Electric Rifle. The Taser fires two small dart-like electrodes, which stay connected to the main unit by conductive wire as they are propelled by small compressed nitrogen charges similar to some air gun or paintball marker propellants. The air cartridge contains a pair of electrodes and propellant. Ok now you know the technical details about the Taser. Here is what I think about Tasers. I think the cops are going overboard with the Taser. Initially it was a seldom used device to control unruly and potentially dangerous suspects and felons. Now it seems to be used more and more often for less and less unruly and potentially dangerous behavior. Its kind of like, “I have a taser so I can use a taser whenever I like”. In 2008 a 66 year old Minister was tasered by hospital security guards in Toledo, Ohio. The minister joked about a security guard’s lack of a smile which resulted in the security guard and four of his cohorts dragging the minister out of the hospital where he was beaten and tasered. Three people have died after being shocked with tasers since deputies throughout the Riverside County, California’s Sheriff's Department began using the so-called less-lethal weapons a year and a half ago. A few people actually catch on fire after being tasered. The Taser Company explains this is very rare. I would suppose the guy who is actually on fire is probably thinking, “no problem, I understand that my sudden combustion is an extremely rare side effect of the tasering process”. The best story I have read about taser abuse was on September 2, 2009 and concerned a 76 year old man in Glenrock, Wyoming who was tasered while driving his antique tractor in a parade. He apparently wanted to leave the parade route, earlier than the town cops wanted him to leave. This obviously is a serious crime, a 76 year old man driving an antique tractor in a parade. The incident nearly incited a riot as outraged neighbors rushed to his defense. Now residents of this tight-knit town of 2,400 are seething over what they see as police brutality, and town officials are scrambling to ease the tension. The Taser Company offers the taser gun to anyone. You don’t have to be law enforcement or military personnel. You know it might be a handy tool to have. The lady in the 10 items or less lane at the supermarket, you taser her when she pulls item number 11 out of her shopping cart. The next door neighbor decides to mow his lawn at 8:00 pm on a Saturday night when you are having a barbeque for your friends, you got it, let him have it. Like many men, I screw up pretty often around the house. If the Lovely Sharon had a taser, I would be toast, literally. Now this is quite a teaser. You have to read a news article that starts out like this. I guess it is a good rule that prohibits urinating on the bus, but the stinky part of the rule seems fraught with issues. First, it makes you wonder who enforces this rule, who would want the job to enforce the rule and exactly what qualifications do you need in order to get the job. I suppose you must have a nose and must not stink yourself. The first one says “I robbed a bank and took two women hostage”. Second one says “I killed a guy that was irritating me at a bar”. Third one says, I smoked a cigar at the golf course and then rode the bus home”. Third, if you go to jail and then decide to take a shower in jail, say, after about two months, do they let you out of jail? Fourth, what if you did not originally stink but you sat by another passenger who did stink, he gets off the bus before you but now you smell like him, so you now stink. Oh boy, $500 fine or six months in jail. If this rule were in effect in Sandy, Utah, almost every man in my Thursday golf group would be a border line or actual criminal. I assume they don’t need a new rule to prohibit urination on the bus. It is probably already illegal. If not, then it would be ok to urinate on the bus until the rule was duly adopted by the city council. Something tells me this stinky rule should be reconsidered. Maybe you just throw the stink pot off the bus. Yesterday our daily mail contained a plastic baggy from the US Post Office that had the words “Because We Care” printed on it. Inside the baggy was a multi- page brochure from Turly Vineyards who makes an excellent red Zinfandel wine. The brochure had about 8 large holes of varying size puncturing each of the pages. When you held the brochure up, you could see right through it. Each hole appeared to have singe marks or burns around its edges as though the hole was created by a flame. The brochure was essentially unreadable. Even though the brochure was stabbed and burned to death by the post office in the mail handling procedure, the US Postal Service cared enough to put the mangled brochure in a baggy labeled “Because We Care”. We are sorry we destroyed your mail but because we like you and care for you, we have delivered the destroyed mail to you. Just think about it, what if the US Postal Service was in the business of delivering dogs. Friday – teach English to underprivileged, third world orphans; feed the homeless; help surgeons remove spleen from uninsured democrat who has been waiting for congress to adopt health care reform.